Items that don't fit in with some other category will appear here. All kinds of Sonic the Hedgehog items that just don't fit in anywhere else--until enough items build up to create a category, then the item/s will shift off of this page. Anything from nick-nacks to toys, if it's American and Random, it's here too. Wind up toys! 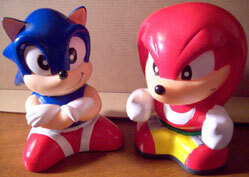 These are rather Japanese looking, but they were supposed to have been released in the USA, and England as well. 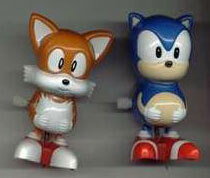 Where are Tails' tails? They are small and moulded on, which seems somewhat lack-luster. The back-cards for both are identical. 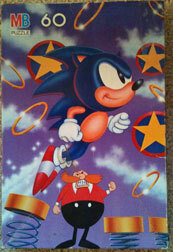 A collection of animation cells from the USA Sonic cartoons. Every so often, a lot of these (or one at a time) will crop up on Ebay. They tend to run around $10 each, so they're not difficult to collect. 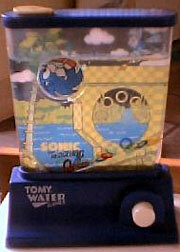 A Tomy water game. This is a varient of 'catch small rings on pegs inside' game. You push a button to send jets of water through the game that move the rings around. It looks like the Sonic gizmo might turn, as well. You can see the rings at the bottom. This is a rather appropriate mini-game. It does not seem very common. An odd, stubby bank. Looks to be made of rubber. The likeness is not all that great, either. 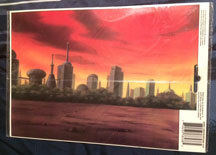 These were plentiful on Ebay in the early 2000s. It was not very expensive. Where are all these things coming from? 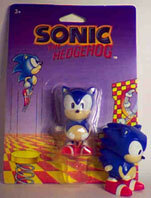 Note that it is not the new-style green-eye Sonic. This is now suspected to be a BOOTLEG ITEM. It is not confirmed a fake, so it stays...for now. The later banks may have been created from the bank seen below. Some Sonic the hedgehog Banks. Notice that this one is modeled after the candy-container on the right photo. It has a black 'belly button' area to distinguish it as a bank. 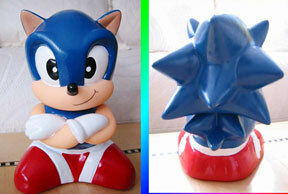 The Sonic sitting on the bolt is the bank in the right-hand photo. The stopper is located under the bolt. 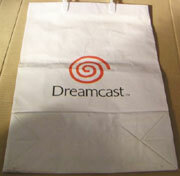 This bag isn't directly Sonic, but it is signifigant. 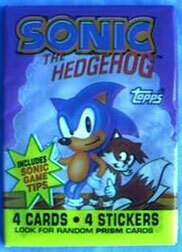 Topps Sonic the Hedgehog trading cards. This was the first series of cards released in the 1990s. (There was not another American series until the Sonic X cards) These were sometimes base-ball card like, and some had stickers which you could peel off. Mostly, they just took screen shots from the Sonic games (Sonic 1, Sonic 2 = all they had access to at the time) and added in various stock art. This caused a rather lame effect, as you can see the stock art was not much good. 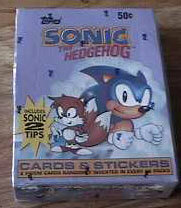 What is that horrible monster behind Sonic on the card pack? They usually had tips or descriptions on the back, and sometimes an extra little scrap of stock art. The rarest of these are the Prism Cards. You are unlikely to find any of these. It is thought that there are 4 different prisms. These are somewhat like silver-ish holograms but not-so-3D. 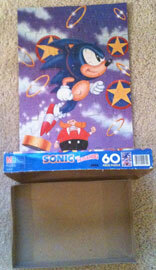 Sonic lunchboxes with thermoses. Both fairly classic. There were several of these, but these two are more common. You need to be careful of the thermoses, as the paint can flake with age. 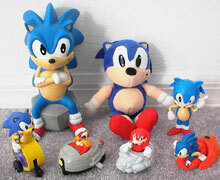 The one to the right is based on the special stage of Sonic 3. 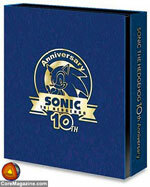 This is the 10th Anniversary pack, which was released for free in the USA. 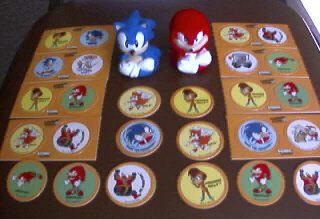 The CD has music from Sonic games, and the booklet has a breif history with photos. The cover is quite fancy, and well-embossed. The coin is real metal. (Note that the photo does not show an actual coin, the real one is more chrome-gold) These could be difficult to find at times, and some stores only had them on pre-order. Best Buy was known to have a good supply. This is a truly nice collector's item. 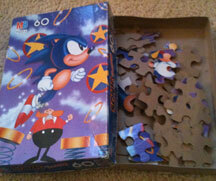 Two Cracker Jack prizes created in honor of Sonic 3. The white item is a top. The purple one is a suction-cup walker. You are supposed to throw it at a wall and it will rotate as it goes down. However, these are also known for not working very well. These are less common than the Meal-Toys from fast food areas. What are the bust things in the background? They are actually Finger-Puppets for use in the bath. Avon Makeup Products had a Sonic deal in one of their catalogs/sales. They are slightly reminiscent of the Japanese banks, but they have no bases. See more about those at Hygene. 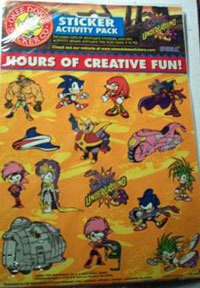 Okee Dokee Sticker Co. did one run of Sonic the Hedgehog stickers. Unfortunatly, they chose Sonic Underground. This is actually an "Activity Pack", where you are supposed to stick the stickers onto that background scene to make different layouts. How this is entertaining, I'm not sure. Notice the claim of "Hours of Creative Fun!" You would actually have to be VERY creative to have 'hours of fun' sticking stickers to a background. 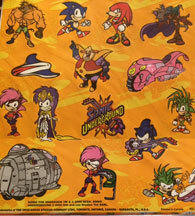 The stickers include Sleet, Dingo, Manic, Sonia, Robotnick, Sonic, Knuckles, Sonia's Bike, Aleena, the Logo, a hover-board & their space...trailer home. It also has shots of each of the siblings playing their instrument. 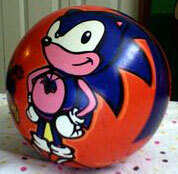 This uncommon item is a Sonic Underground theme 'play ball'. A play ball is just a generic ball, usually smaller than a basketball, with no texture that is made of semi-soft rubber. It can be used for outdoor games and is non-specific. What makes the ball SU? They grabbed a stock Sonic and drew the 'guitar pendant' onto him, to make him 'underground'. This was available at Wal Mart during the time that SU was on the air. Being from SU, it isn't that common of an item. Owned and photographed by Macey-Grey.